MEXICO CITY – Mexico’s No. 2 official said the government had resumed talks with the militant CNTE teachers union and proposed negotiations on the country’s current educational model, EFE news agency reported. In a brief televised message, Government Secretary Miguel Angel Osorio Chong said Wednesday July 6 that in recent days the government had responded to the CNTE’s roadblocks and other protest measures by both seeking to defuse the situation and ensure the right to demonstrate while also safeguarding the rights of all Mexicans. He said that approach had led to the resumption of dialogue. The teachers once again demanded the repeal of a 2013 education overhaul that includes regular evaluations of education and ends longstanding union privileges. 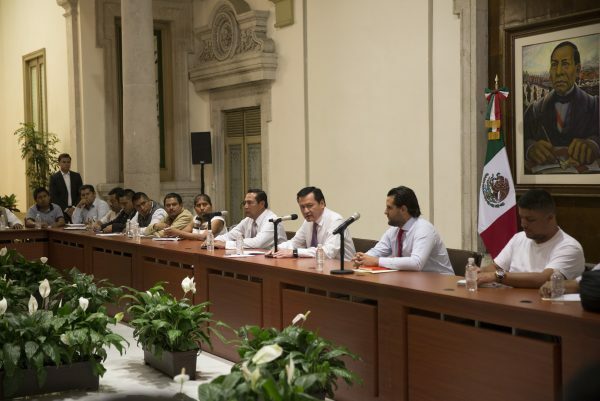 The government has said it is willing to listen to the CNTE, but the Institutional Revolutionary Party, or PRI, administration of President Enrique Peña Nieto has repeatedly stressed that the 2013 law is non-negotiable. On Tuesday afternoon, around 4,000 CNTE-affiliated teachers and their supporters marched in Mexico City to demand a resumption of dialogue with federal authorities.